Iceland's food can be considered costly when comparing what one is used to, living in Canada (or the US). There is no denying that eating in Iceland can cost a Canadian a small fortune but just try the food there and try to tell me that you would rather continue to eat the second rate stuff at home. I see it whenever coworkers or friends make a run to the food-court to grab a quick lunch from a big box corporation with faceless employees assembling your sandwich like automatons. All too often, we walk into grocery stores and buy all our food from a grocer who is essentially a distributor of food from various farmers who we will never know or meet. While this sort of consolidation in the supply chain is efficient and cost effective, we miss some of the more minute details such as knowing that the ground meat we're getting isn't an unknown mixture of several animals' body parts of an unknown source or background. Food is important to me... not just because I love eating a good meal and nothing could make me happier most days, but, the food system tells an intricate story about a nation's health and their perspectives on life itself. I don't intend for this post to get all preachy but rather, to feature some of the fabulous food we had in Iceland. A big foodie scene isn't typically associated with Iceland. France, Italy, Japan... they all boast a fascinating food scene. I mean like ADW mentions, Iceland isn't exactly the first place people think about going to, in the middle of a bizarre Canadian winter. But, with the financial melt-down in 2008, the Icelandic Krona exchanges for a lot more CDN than it used to. Eating in Iceland for a Canadian is miles better than it used to be. What do Icelanders eat? It seems like a barren volcanic landscape without much other than the sea. While this is partially true, Icelanders boast some of the best dairy, lamb and fish/seafood. I feel they're smart and efficient with their agricultural products. They do little beef and much of it is imported but, their lamb is some of the best I've had. It's not overly gamey, readily available and generally impeccably done. They are completely self sufficient with their dairy and have many green houses growing tomatoes, peppers and salad greens. The highlight of being an island gives them the opportunity for incredible seafood. We feast on cod, plaice, whale (minke, mostly), lobster, monkfish, shark and other creatures of the sea. 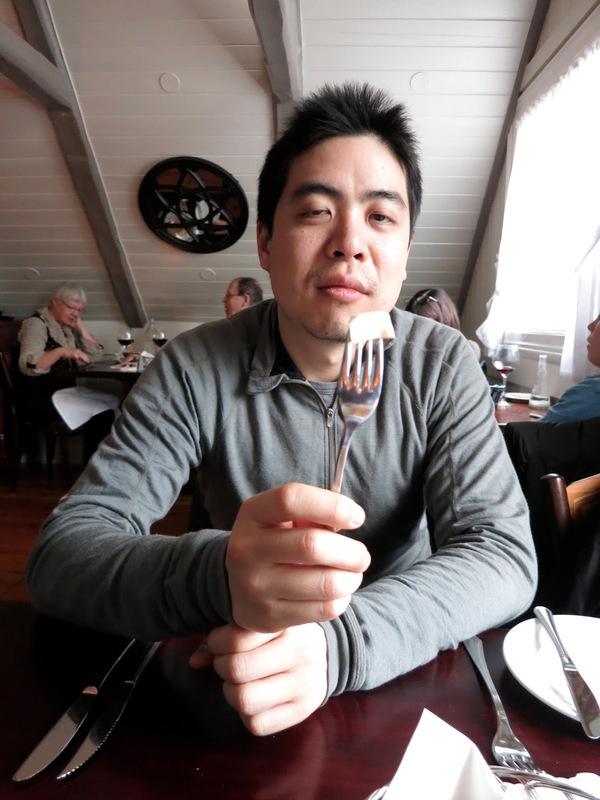 When I travel, I like to learn about the culture, people, the country and the food--which is actually part of all those. Scanning the Frommers guidebook, I make a list of the things I must try on this trip: cod chins, puffin, guillemont, whale, fermented shark (Hákarl), brennevin, meatsoup, skyr, and horse. Yes, I ride and love the horse but I'm not adverse to eating my equine friends because it's a great honour to provide sustenance for another. I'm not weird to raise my pets for consumption since building a bond with a critter and then killing it to eat is a bit unusual. 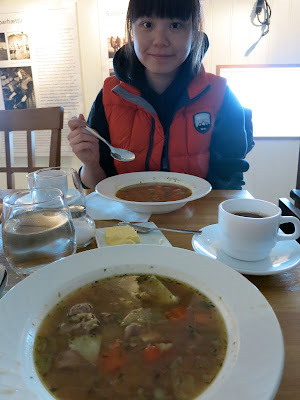 On our glacier and volcano expedition, we stopped by Country House Anna for their delicious meat soup. The meat soup is a welcome lunch that warms both the soul and body. Excited to chow down on meat soup! Our dinner was an informal evening at the Sea Baron (Saegreifinn) where we dined on minke whale, plaice and cod. The whale is interesting in that the texture is like a lean soft beef. However, after our whale watching day, we discovered that traditional Icelanders don't really frequently eat whale and it's more of a tourist thing where they want to "try" it... yep, that's us :( I didn't feel so good about eating whale after that day. That's not beef... it's whale on the left! Sea Baron is known for their lobster soup.. Get yourself a cup! Grilled plaice and cod. yum! We also eat a lot of skyr while we're here. It's not yogurt but has similar consistency to greek yogurt and it also comes in a variety of flavours. The major difference is that it's low in fat (naturally) and high in protein. The breakfast of champions, pipes a random icelander: mix it with milk and sugar and you're good to go! Bill Clinton ordered one with "just mustard"--what a blasphemy! Another dinner we had was at the Vid Tjornina seafood house. This place is near the city center's pond and it boasts an eclectic interior and unusual menu. For some reason, I have no photos to show for it but remember having an enjoyable 4-course "surprise" meal. Not the best picture of ADW... but this is my post so he'll just have to deal with it! The shark is of a squishy mozzarella texture but firm fish when eaten. It smelled like a really ammonia-y stinky cheese and is not for the newbie foodie--apparently Gordon Ramsay spat it out. Go figure. There is no shortage of coffee houses in the city. We try Mokka Kaffi (the oldest cafe in town) and have breakfast at the Grai Kotturinin. Their coffee is so good. 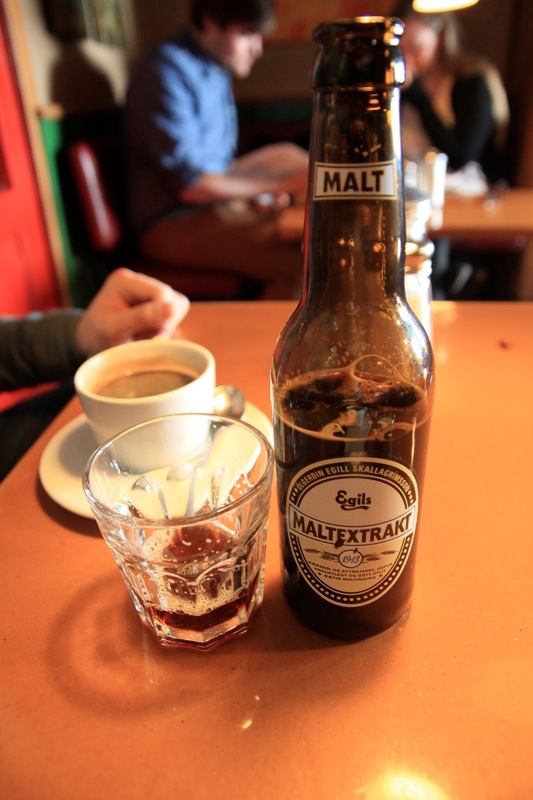 We also try a very Icelandic "malt extract" which is really tasty! And we rounded up our trip with a dinner at a Chinese restaurant we found. So far, everywhere we've travelled to, ADW insists that we try a Chinese restaurant. I have over-paid for noodle soup in London, lined-up for Kung Pao chicken in NYC and sipped Inca Cola with my tofu. The last thing that I would mention about eating in Iceland is their water. Everywhere here, we're used to that chlorinated tap water that tastes stale and chemically treated. And, if you eat with me, you know I'd rather die of thirst than drink tap water or bottled water. But, in Iceland, even the tap water is refreshing, sweet and straight from the glaciers. No need to buy water here, folks. Just bring a water bottle. The salmon was my favourite!!! And I wish I could pipe that water back...just like mineral water!